Recently we had our AGM which gave us another opportunity to try and help our church see itself. That might seem like a strange idea, but for most people, they only see (or even hear) about the aspects of their church they’re involved in. This can lead to misunderstandings about why the staff are never around, or a feeling that God’s not at work in your church, when there might be things to be very excited about. We want our church family to see itself well… see how God is at work in it, and how God is at work through it. So, we came up with this infographic that tries to display something of the messiness of church. 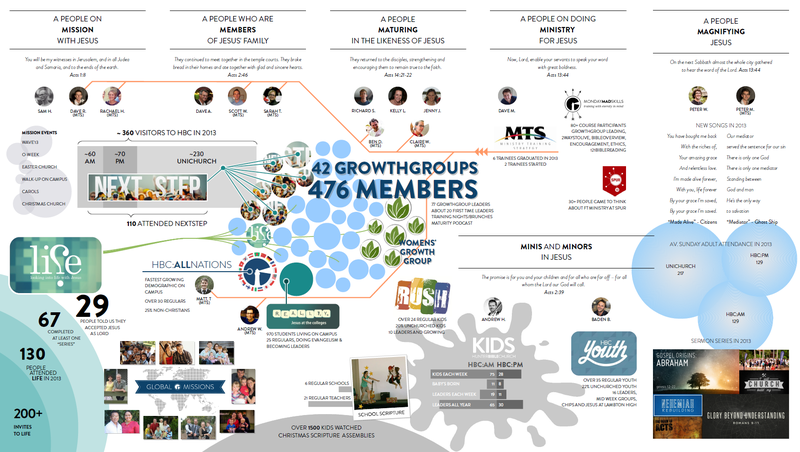 A growing church family is organic and interrelated. It’s interdependent. This info graphic isn’t meant to make church “understandable”, but rather it’s meant to make the messiness of church understandable. (See it large here).